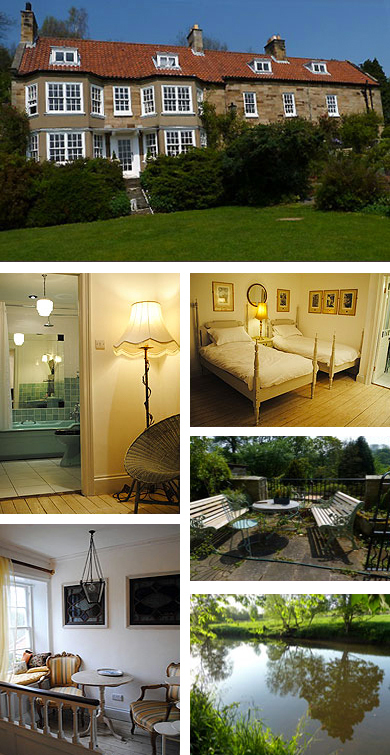 We offer Bed and Breakfast accommodation at Groves Hall. Situated just two miles outside Whitby, North Yorkshire, in the beautiful and peaceful Esk Valley, Groves Hall has a commanding view over the surrounding countryside. We are lucky enough to be on the route of the North Yorkshire Moors Railway, and in the summer, steam trains go past four times a day. It is a Grade II listed Georgian stone built property set in seven acres, with mature gardens featuring specimen trees and plants. There is also 300 metres of river frontage on the Esk, from where it is possible to fish for salmon and trout, if you purchase a day permit from us, and have a fishing license. The local area is wonderful for walking, cycling, fishing, painting, horse riding, birdwatching, relaxing etc, with the bonus of being seven minutes drive from the bustling town of Whitby. We offer a large ensuite twin room overlooking the garden, with two single beds, and a separate private area to have breakfast. There is an additional sitting room for your private use on the ground floor. Free Wi-Fi. Freesat television. Parking is on the forecourt. We are a non-smoking household, and do not take pets. Though we do have cats! We cater for most dietary requirements, using local produce. Our rates are £102 per night for bed and breakfast. Prior booking by credit/debit card preferred.